This second part moves beyond our ‘neighborhood’ and identifies some of the interesting, more distant objects for you to observe. There are many objects you can see in the night sky that are some distance outside of our solar system. Because of this, they may be more difficult to see, but not impossible. Double stars are two very close stars, or twins if you like. Unaided, they appear as either a bright, fuzzy looking star or if they are further apart, you may be able to make out the two separate light sources. A telescope will make it easier to see them as separate stars. In most cases you will see that they may be different colors and one may in fact, be brighter than the other. Star clusters may appear as several really close stars or as a cloudy mass to the naked eye. But look at them through a telescope and you will see that they are actually made up of far more stars. An open cluster is a group of several stars of various brightness and colors. Unless they contain any large stars, you will most probably see them as a cloudy mass with the naked eye. With a telescope you should be able to make out the individual stars, as they will appear much clearer, especially if you have a telescope with a large aperture. 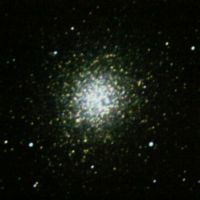 Like an open cluster, a globular cluster is a collection of stars, but there are usually many more stars, maybe even millions. Unaided, they will appear as a largish cloudy, haze with perhaps the largest stars visible. Look at one with a telescope and you will see so many stars, it will be quite a sight. It may even appear as an explosion of stars of many different sizes and colors. Nebulae are very exciting objects to look at. They are large collections of dust and gas and are often referred to as ‘stellar nurseries’. With the naked eye, you will probably only see a cloudy, fuzzy mass depending on the size and brightness of the nebula. Look at one with a telescope however and it will be quite spectacular. You will see large, bright colorful clouds of gas with stars twinkling amongst them. 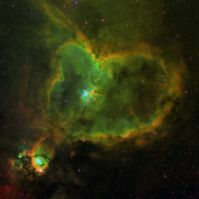 Some will be more spectacular than others, even taking on familiar shapes as in the case of the Heart (as visible to the right) or Horsehead nebulae for example. The great thing about looking at galaxies, is that you are looking at something that is millions of miles away. Because of this immense distance, galaxies are more difficult to see. With the naked eye, you might be hard pressed to see them at all. At best, all you will probably see is a faint, blurry blob. However use a telescope and you will get a more interesting view. You should be able to distinguish some structural detail like a central hub or cluster of stars and surrounding arms or bands. A larger telescope will give you a more defined view, but you may still have to use averted vision and spend some time practicing to see some of the fainter, more distant galaxies. There is so much more for you to point your telescope at than just the obvious objects. Hopefully this article has been quite inspirational for you. Do it when conditions are ideal and you will have a very memorable night of viewing that you will be keen to repeat on many more occasions. This entry was posted on February 26, 2012, 9:12 am and is filed under Information. You can follow any responses to this entry through RSS 2.0. Both comments and pings are currently closed.